This is Lou’s story beginning with his enlistment into the U.S. Marine Corps at age 17 and his service to his country during WWII. Lou left New York, and his family, after enlisting in the Marine Corps at age 17. He was ordered to Camp Roberts, California. After finishing boot camp rifle range training there, Lou was sent to Mare Island Navy Yard at Vallejo, California. He served there at the Marine Barracks, Naval Ammunition’s Depot, doing guard duty from March 12 to September 3, 1942. He was transferred to a replacement battalion at Camp Elliott, San Diego, for further transfer overseas. Lou, and his unit, sailed from San Diego aboard the Matson Liner SS Lurline on October 13, 1942, and arrived in New Caledonia 15 days later on October 28, 1942. Some of his buddies in his unit were Hob Johnson, Bill Austin and Lloyd F. Stewart of San Francisco. His buddy, Hob Johnson, transferred to the USS Indiana, but Lou remained until September 11, 1943, a total of 11 months. Lou served 3 years in the South Pacific with his orders also taking him to Guadalcanal, Bouganville, Puruata Island, Rabaul, the Marshall Islands, Marianna, Johnston Island, and Oahu. Lou landed in Bougainville on November 1, 1943. He described this experience in writing… “automatic weapons were set up to defend the beachhead from possible Jap counter-attack. The Third Marine Division Troops move out from beachhead at Empress Augusta Bay to take up new positions inland. The “Beachhead Zone” was taken to allow U.S. to build an airfield within fighter plane range of the Japanese base at Rabaul to the north. Daily torrential rains added to the hardships endured by the Marines who had to keep supplies moving through the seas of mud and by Sea Bees of the 53rd Naval Construction Battalion, who had to build the airstrip and roads throughout the the beachhead area.” Photos in Lou’s albums show the Marines unloading aviation gasoline at Puruata Island. He continued, “The fuel was stored on the island to isolate it and minimize damage in case of bombings.” Another collection of photos in his album show the realities of WWII; (1) the bodies of Marine 90 man antiaircraft gun crew of the 3rd Defense Battalion being removed after the position received a direct hit during bombing, (2) Marines dislodging the landing craft that broached on the beach. Seas were extremely rough during the landings. Infantry men supported by tanks advanced through the jungle area. During this action, a wounded Marine required medical attention. Evacuating the wounded Marine was a difficult task because of the rugged jungle, and (3) A Marine was wounded during an air raid on the Puruata Island fuel dump, and evacuated to the air station. The dump was hit several times. Lou writes of how he observed services for several Marines. Twenty six Officers and 410 enlisted men men were killed during the fighting on Bougainville. Troops of the 37th Army Infantry division arrived early in December, 1943, to relieve the Marines. Lou left aboard on LST 488 on December, 10, 1943. Lou reached his home base on Guadalcanal, a distance of 355 miles, two days later. After a brief rest period, his unit began training for a new campaign. The invasion of North Ireland, an island close to and east of the Japanese naval base at Rabaul. In late April 1944, just before Lou’s unit was to depart, the operation was scrapped. On may 8, 1944, Lou had a hernia operation at Navy Mobile Hospital, No. 9. On June 9, Lou was injured in a jeep accident and was re-hospitalized for one week. This prevented him and his friend, Bill Austin, from leaving with his unit for the campaign on Guam in early June. On June 30, however, he and his buddy followed with the Rear Echelon of the 3rd Marine Division aboard the USAT Seafiddler, a transport ship. The vessel anchored at the Eniwetok Atoll in the Marshall Islands for almost a week, then sailed to the Marianna. Lou writes, “The initial landing of the division took place on July 21, 1944. Lou landed on July 29th. On August 4th, he joined the 1st Provisional Marine Brigade. After the beachhead phase of the campaign ended, the 3rd Division, First Brigade and 77th Army Infantry Division, backed by tanks, attacked to the north to knock out scattered Jap defenders. U.S. Troops reached the north shore August 10, when all organized resistance ended. Marines flushed die- hard Japs out of the jungles hiding places. Mopping-up continued for weeks because of Guam’s size and its terrain offered the enemy excellent cover. Many weapons were collected from former battle sites. War dogs were invaluable in flushing out enemy troops during the mopping-up operation.” Approximately 19,000 Japanese troops were stationed on Guam. 10, 646 of them were killed. The American’s death toll was 1,500. Lou left Guam aboard the USAT Cape Cleare on August 30, 1944. After a 3 day stop over at Enewetok Atoll in the Marshall Islands, returned to Guadalcanal on September 15, 1945. Before the year was out, Lou’s unit was preparing for the upcoming Okinawa campaign. On January 28, 1945, however, Lou received orders to return to the United States. On February 5, he flew from Guadalcanal to Hawaii, landing for brief periods at Kwajalein in the Marshall Islands and tiny Johnston Island. He spent two weeks in Camp Catlin, Oahu. On February 17, he flew to San Francisco, where he spent three days at the Naval Station on Treasure Island. closeness to family while at dinner with his Aunt Rose McKie in the Green Room of the Hotel Edison in New York City, drinks at the Music Bar on Broadway and 94th with Rose McKie, Mary Castaldi, and Dell Restivo, and more fun with Mary Castaldi at Zimmerman’s restaurant, in NYC. While Lou’s brother, Eddy was home on re-enlistment leave, January 5, 1946, Lou joined him, and his aunt Mary Castaldi, for a night out at Queens Terrace Club in Woodside, Long Island. Mary was 35 years old, Eddy was 19, and Lou was 21. Lou re-enlisted on January 26, 1946. He celebrated this event with his brother Eddy and girlfriend, Babe, and his brother Johnny, and Helen. This was the first time the three brothers had been out together since all three joined the Marine Corps. Lou fell in love with Jane Frances Flannery and married her. Jane hailed from Marlboro, New York. 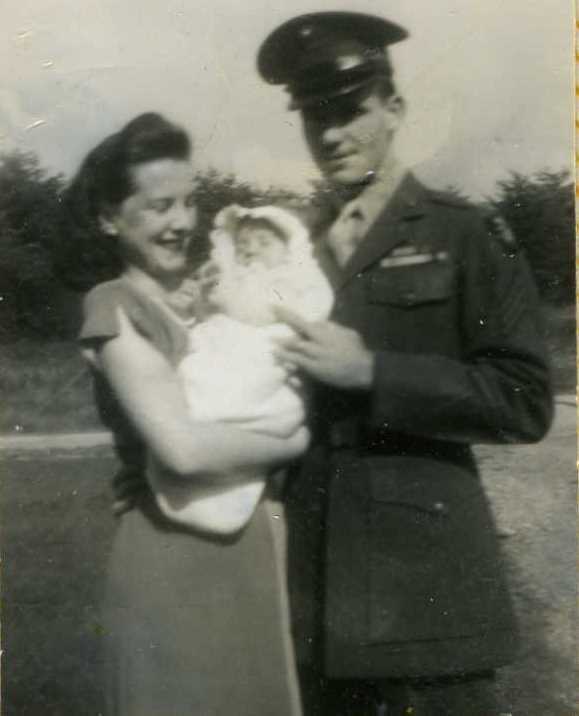 Jane always commented on the night she saw Lou for the first time… “Such a handsome Marine in uniform walked into the room….” After re-enlistment, Lou was stationed in Jacksonville, Florida. He arrived there on April 20, 1946. A week later, Lou checked into Marine Barracks, Naval Air Station, and was placed in the Guard Company where he performed duties as Muster Roll clerk. At first, Lou and Jane lived in a house with cooking privileges until they were finally able to move into a duplex on the Naval Air Station during the first week of June, 1946. Rent was $17 a month plus $2 for utilities. Occupants had to mow the lawns and keep the grounds ship-shape. 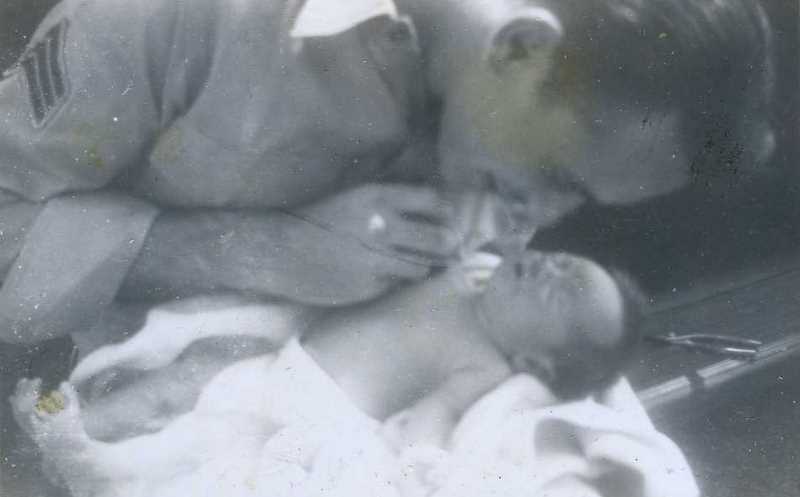 The highlight of the duty at “Jax” was the birth Barbara at the base Naval Hospital, July 3, 1946. Meanwhile, up in New York, Johnny and Helen visited home, and Eddy came on weekends. Finally, Maryann had her three Marines home, and safe. On August 6, 1946, Lou received orders to Headquarters Marine Corps in Washington. Jane and Barbara, who was only 5 weeks old, flew to New York City to stay with Lou’s parents. Lou drove and arrived in Flushing 3 days later. After a few days in New York, Lou drove back to D.C. and on August 12th reported for duty at HQMC, located in the Navy Annex in Arlington, Virginia. Due to the critical housing shortage which still existed in Washington, Lou made arrangements for room and board in a private home in nearby Alexandria, Va. On the following weekend, he returned to New York for Jane and Barbara. At HQMC Lou was assigned as monitor for the Band, Special Services and Post Exchange fields. As such, he was responsible for filling vacant enlisted billets in those fields and transferring personnel accordingly. While overseas in the South Pacific, Lou communicated home to his family by way of V-Mail, a program under which letters were microfilmed and then delivered in small print form. It was designed and used during WWII to save precious shipping space. It permitted aircraft and trains to haul more war gear and less bulk mail to and from overseas military bases. Special 8″ by 11 1/2 ” forms were used for letters or hand drawn messages. The forms were folded into envelopes. At certain processing centers the contents of the envelopes were microfilmed. Reels containing hundreds of letters then were sent to and from overseas destinations by air. When receiving V-Mail for delivery, the processing centers printed the filmed letters. These, in turn, were inserted in small franked envelopes and sent to the addressees. Direct to you from me! To the Swellest mom a guy ever had. In this V-Mail, Lou drew the Marine Corps Emblem in the center and a picture of swaying palm trees in the bottom left corner. I worked in the V-mail building in Flushing, NY. I processed the military mail coming in on the v-mail machines.. A military man would come there to pick them all up, and distribute them to the receiver every so often. This was in 1942, 43 and 44. I was then also a WW 2 widow whose Coast Guard husband went down with the weather patrol ship in the North Atlantic on the USS muskeget. Lee Parker (name at that time).